Welcome. I am so happy that you stopped by. I hope everyone had a joyful Christmas and is getting settled into a fresh start in the New Year. I am back from a blog break and getting back into the routine in my studio. 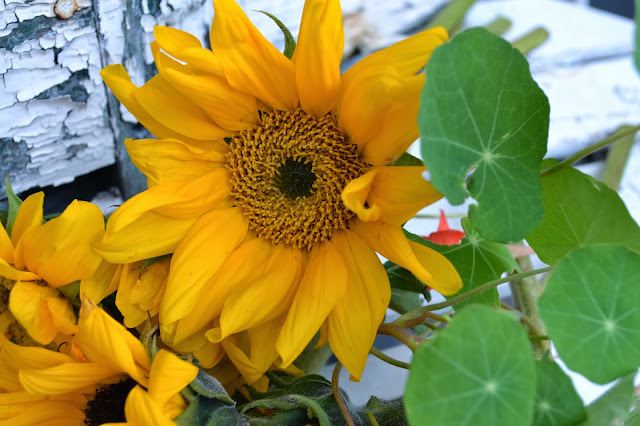 The weather in Southern California has been unusually warm and I am anxious to start Spring planting, even though it is way too early. Th Paper Whites and Poinsettias are still in bloom and red Geraniums and Pansies starting to bloom with the warm weather. Let's join Bentley, my Studio Assistant, in the studio, grab a cup of tea and sit and relax for a few minutes and I will share with you what I have been up to on my break. 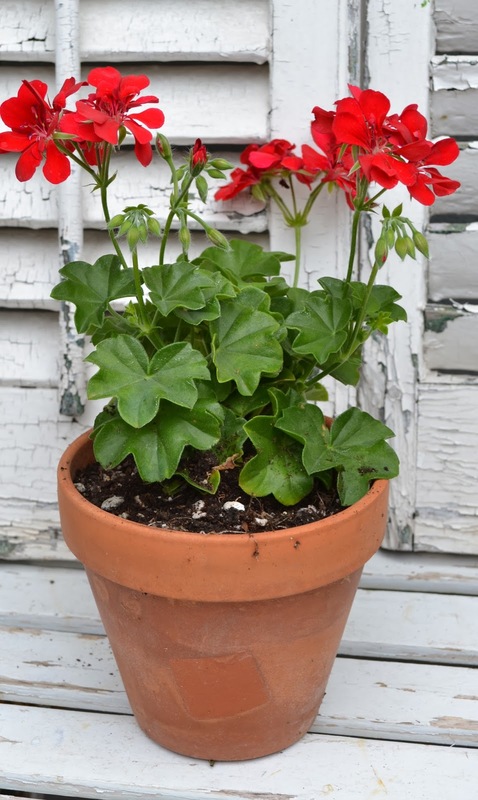 The Geraniums are loving our warm weather. 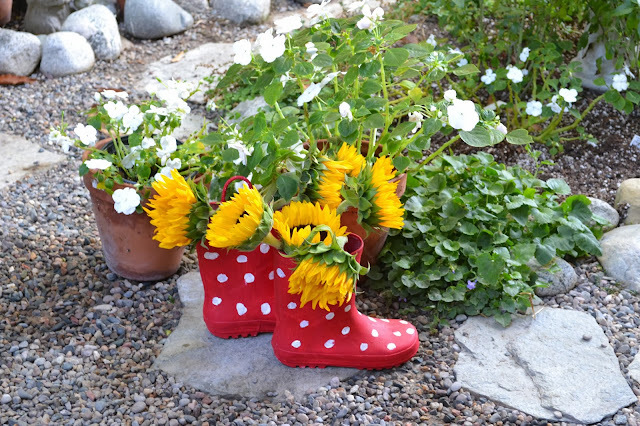 I bought a bunch of Sunflowers from Trader Joe's and popped them into my vintage Children's boots to paint. I love painting my collection of garden boots with blossoms in them. Changed the white polka dots to yellow polka dots!! Thank you for visiting my blog. I sincerely appreciate your visits, e-mails, comments and those following my blog. I read and cherish every comment and blog visit. Please let me know if you have any questions or would like to see me paint something special. Happy New year, Erin! I love the paintings you shared today. Here in sub-zero Michigan they make me feel like spring! 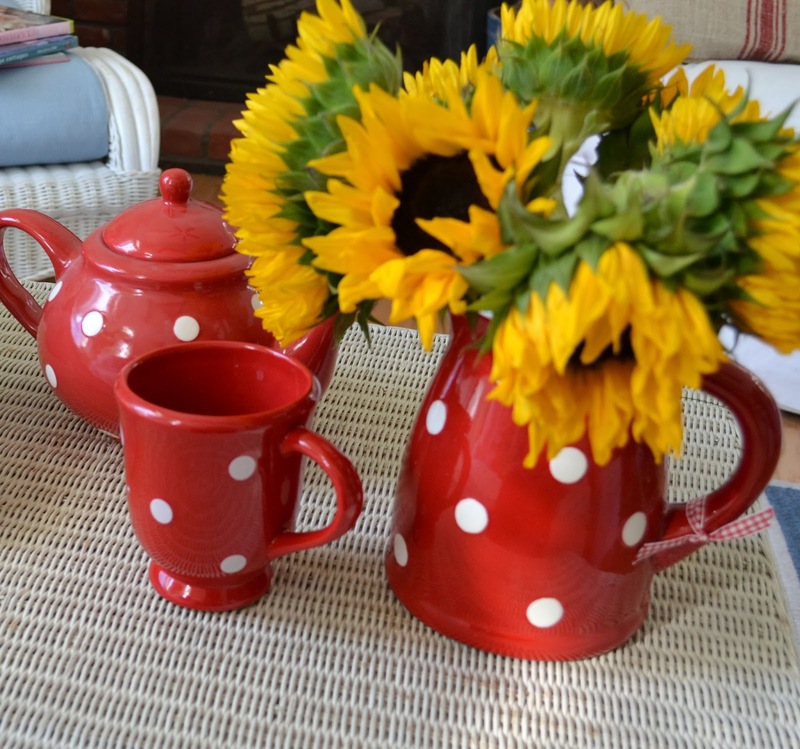 I do love red geraniuns and sunflowers you paint them well. Love the boots as props too! 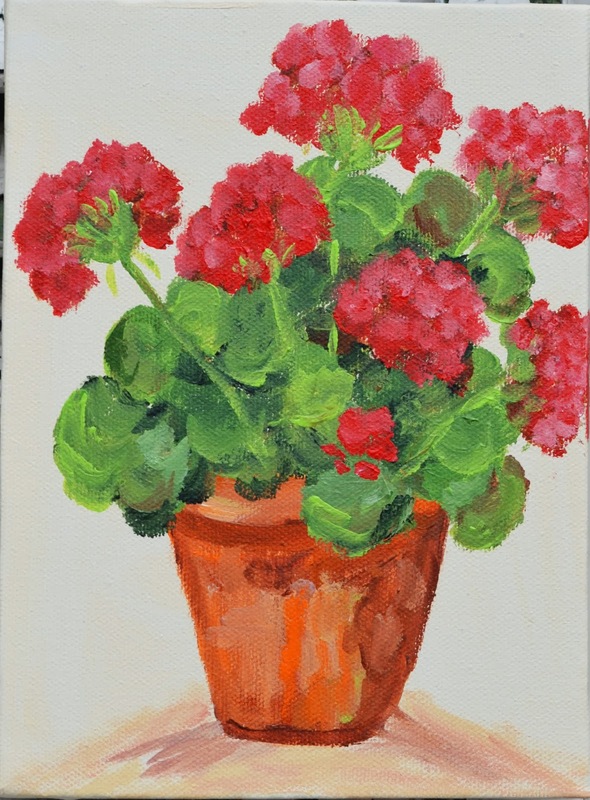 Geraniums are my favorite flower! Red Yeah! Love your art as always! Happy New Year Erin!! 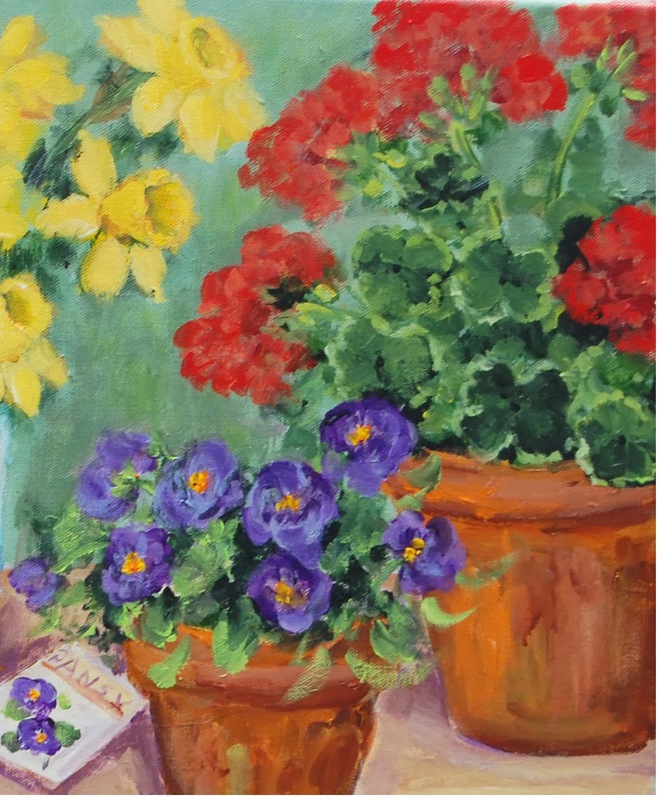 I so enjoy my visits to your blog, gardens and paintings! Your style is so cheerful and beautiful! We're having beautiful weather in Phoenix also and things are blooming early. Your paintings are so wonderful, thank you for sharing! Happy New Year to you and Bentley! Happy New Year Erin. Wish you could send some of that warmth this way, lol... Always love the boots when filled with flowers, especially sunflowers. Happy New Year dear Erin - to you and sweet Bentley. 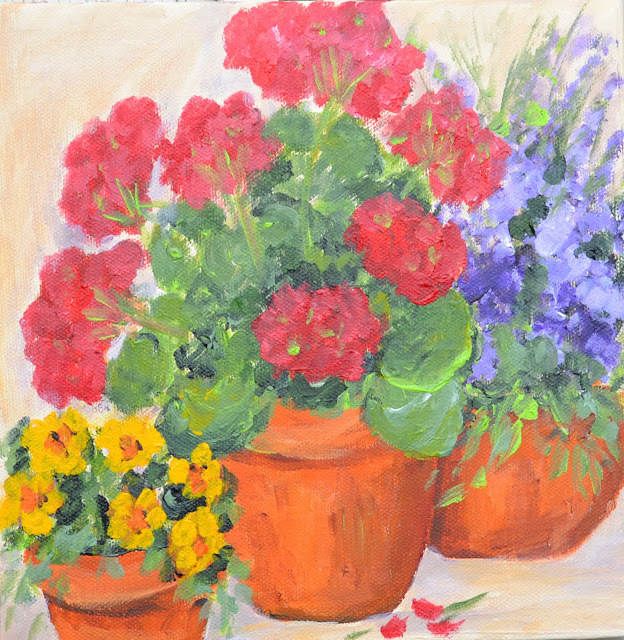 Your brilliant paintings are certainly brightening up another dreary North Carolina winter morning here. It's raining and really warm which is weird for Jan., however, later today, the big chill arrives and we'll be hunkering down with extra sweaters and the fireplace stacked with wood ready to spend a few days close to the hearth! 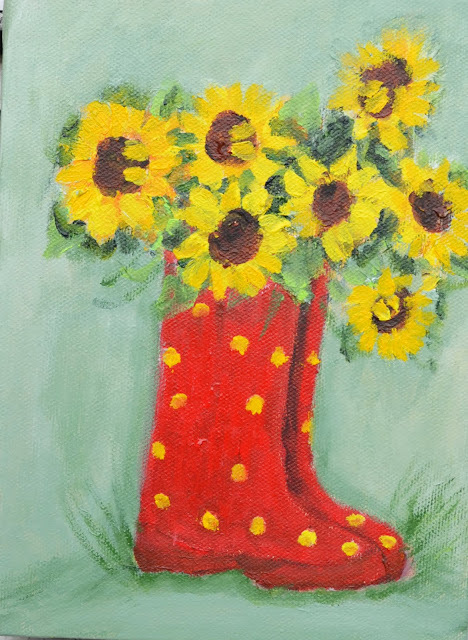 Love those bright red boots - do you wear them? Of course you rarely require rain boots I'm sure - love your climate! Take care dear - enjoy each day of 2014. Nice to stop by here and see your beautiful, bright paintings. Bentley is a sweetheart... he's so cute. Thanks for all the warmth from So. CA! Happy New Year! 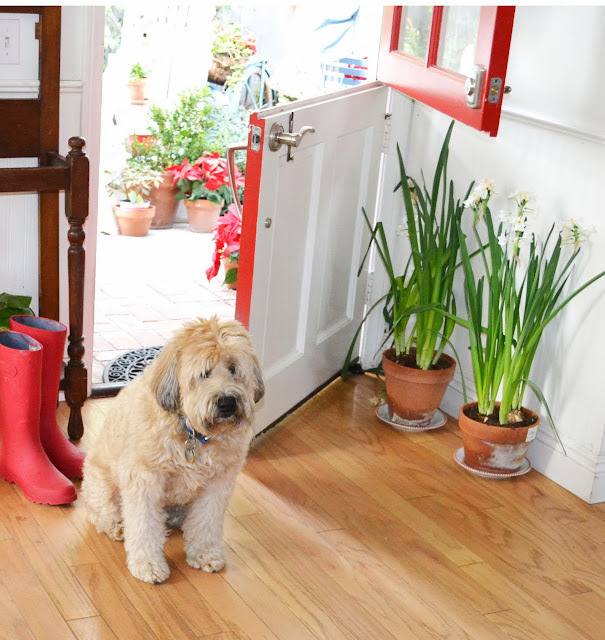 One of my blog friends told me about your blog because I was discussing my Wheaten terrier on my blog and she told me about Bentley. What a cutie! And what a gorgeous blog you have! Love it!